Martin & Buckley, Part 2: Who Were Claiborne Martin’s Parents & Siblings? The Oct. 27, 2018 post on this blog introduced Claiborne (“Clay”) Martin of North Carolina, Elbert and Oglethorpe Counties, GA, and Perry Co., AL. I promised to address Clay’s family of origin: who were his parents and siblings? Answer: there is no conclusive proof, so far as I know. There is a compelling web of circumstantial evidence. Clay’s parents were probably George and Elizabeth (maiden name unknown) Martin of Elbert and Oglethorpe Counties, GA. Most of the evidence concerning Clay’s family of origin is in the land and tax records. Clay bought his first Oglethorpe tract – 147 acres – from George Martin in 1799. The deed states that both George and Claiborne were then residents of Oglethorpe County. Clay paid real money for it: the tract was not a gift, and it does not recite any family relationship between the parties. The deed does recite that the tract, which was part of an original 538.5-acre grant to a Jesse Sanders, was adjacent to William Martin. Also, a Gibson Martin witnessed the deed. Finally, the 1797 deed in which George Martin acquired the tract states that it was located on the Big Creek of the Oconee River. Once again, the “follow the land” theory of genealogy produced a goldmine. Just one deed identifies three Martins who were almost certainly Claiborne’s relatives: George, Gibson and William. In 1798, George sold 125 acres on Big Creek to David Martin. Both George and David were then residents of Oglethorpe. In 1800, George sold to Henry Pope 291 acres on the waters of Big Creek in two separate deeds – tracts of 187 acres and 104 acres.The 187-acre tract was adjacent to Claiborne Martin. The 104-acre tract was adjacent to David Martin, who witnessed the second deed. Also in 1800, George sold Gibson Martin a tract of 175 acres in Oglethorpe. That tract included the plantation where George then lived. The deed provided that George and his wife Elizabeth would retain possession for life. Although the deed did not specify the location, later tax records establish that the tract was on Big Creek and that it was adjacent to Claiborne Martin. Those deeds are good circumstantial evidence that Clay, George, William, David and Gibson Martin were family of some sort. They had another common characteristic besides the Martin surname. All five of the Martins signed deeds the majority of the time with a mark, as opposed to writing out a full name. That helps distinguish this family from a plethora of more educated Martins in the area, most of whom typically signed a name in full. There is also an intangible factor lurking in these deeds. George possesses an aura of seniority: he was the grantor in every deed and he reserved possession of the home plantation for life. Moreover, George has evidently sold all of his land in just a little over two years to a group of men who mostly shared his surname. This raises the inference that George didn’t expect to live much longer and was dividing up his estate – presumptively to family members. A reasonable hypothesis is that George Martin was the father of Claiborne, David, William and Gibson. Gibson’s acquisition of the home plantation, where George reserved a right to live for life, is almost conclusive proof of a father-son relationship despite the failure of that deed to recite one. The next place to look for evidence is the Oglethorpe tax records. The first year I found these Martins on a list was 1799, when David, George and Claiborne appeared in the same district. For some unknown reason, William was not listed, although he evidently owned land there as of George’s 1798 sale of land to Claiborne. Gibson did not yet own any land in 1799. By 1806 – the first year after 1799 for which there is an extant tax list – George was no longer enumerated. The 1807 Georgia land lottery establishes that he had died by then. Eligible participants from Captain Pope’s district in Oglethorpe included Claiborne, Gibson and Elizabeth Martin. She was identified as a widow. George must have died some time during 1800 through 1805, because he was listed in the 1800 census. David and William were evidently no longer in Oglethorpe. So … let’s follow the sons. First, where did David and William go? The answer: Baldwin County, Georgia. David sold his 125 acres on Big Creek to Henry Pope in 1801, including the plantation where he lived. That was apparently all of David’s land in Oglethorpe, and he didn’t appear in any other records in that county. Frequently, family members who disappear like that cannot be found. David was nicely traceable, thanks to his wife’s distinctive name. Back in Elbert County (where this Martin family lived before they were in Oglethorpe), there was a 1796 deed in which David and Alay Martin conveyed land on Falling Creek. The deed was signed (as is customary in this Martin crowd, with marks) by David (x) Martin and Ala (x) Martin. You have to smile when you see the same name spelled two different ways in the same deed. 1789 deed from George Martin and wife Elizabeth to Joseph Bell, all of Wilkes County, 579 acres granted to George Martin in July 1786. 1792 deed from Joseph Bell to David Martin, all of Elbert County, 300 acres in Elbert (which was created from Wilkes in 1790) on both sides of Falling Creek, part of 579 acres granted to George Martin. Archer Skinner– more on him later – was a witness. 1792 deed from David Martin and wife Alcy – a third spelling of her name – of Elbert Co., GA to Archer Skinner of Wilkes Co., an exchange of land in which David and Alcy (Alay/Ala) traded the tract David acquired from Joseph Bell. David signed in full, the only instance of that I have seen in this Martin family. His wife signed with a mark, as Alay (x) Martin. Clabourn [sic] Martin witnessed the deed, his first appearance anywhere in the records, at about age twenty-five. Here they were, in the period from 1789 through 1792 – George and wife Elizabeth, Clay, and David with wife Alay, Ala or Alcy – linked by Elbert Co. deeds, several years before they appeared in Oglethorpe. A minor aside: Falling Creek is going to be a key link to the Martins’ extended family. More than a quarter of a century later, Alay and David appeared again, this time in the records of Baldwin County. David had died by then, leaving his wife and children. Alay Martin, widow, and David Martin’s children participated from Baldwin as one entry entitled to two draws in the 1821 Georgia land lottery. Baldwin County’s records were almost entirely burned to a crisp by William Tecumseh Sherman. 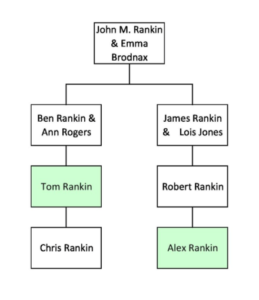 Ironically, Baldwin (and not Oglethorpe, where there are excellent surviving records) is where I finally found conclusive proof of some family relationships among these Martins. In Baldwin, the only surviving antebellum county records were those in the office of the probate judge, which miraculously survived Sherman’s conflagration. They included the will of one William Martin, proved in Baldwin County in 1808. William’s will named his brother David Martin as his executor and David’s son John as the only beneficiary. “The subscriber, having taken that well known stand in Milledgeville, formerly occupied by Thomas Dent, intends keeping a House of Entertainment … He can accommodate from fifteen to twenty members of the Legislature in a genteel manner.” Signed David Martin. A “house of entertainment” (not what you might think) was a local pub/boarding house where one could eat, drink, and perhaps get a room for the night, much like the so-called “ordinaries” of Virginia. Sherman undoubtedly reduced it to a heap of cinders, too. Earlier Wilkes County tax lists provide a clue to David’s age. David made his first appearance anywhere in the records in 1785 as a landowning minor in Wilkes County. In 1787, he appeared again in the Wilkes tax records, still a landowner – but of full legal age. Taken together, those two records suggest that David was born about 1765-66, since Georgia taxed free males at age twenty-one at that time. That birth year, plus a marriage and first child born some time during the 1790s, place David (and therefore his brother William) in the same generation as Claiborne (born 1767) and Gibson (born 1770). Alay and David’s children had all disappeared from Baldwin by the 1830 census. I don’t know where they went. The only proved child is John. However, a William Martin appeared with Alay among the 1821 land lottery participants from Baldwin, and he is probably another son, named for his father’s brother. If you have a Martin family with Georgia origins and someone named Alay/Aly/Alcy in your line – possibly all nicknames for Alice – you might consider looking at this family. Check out the Martin Family DNA Project for help. I looked at it briefly, but didn’t spot Clay’s line. As for David’s brother William Martin, there is little information about him other than his 1808 will. His first appearance in the records was in 1798 in Elbert County, witnessing a deed to a tract on the same creek where David Martin owned land. Based on William’s will – a legacy to his nephew John and no one else – he was almost certainly single and childless. I never found the deeds by which William acquired and disposed of his tract adjacent to Claiborne and George Martin in Oglethorpe. However, his tract on Big Creek was mentioned in Henry Pope’s will and was described as containing 147 acres. The acreage figure strongly suggests that George sold the tract to William, since George sold to Claiborne a tract containing precisely that acreage. Finally, we haven’t yet followed Gibson Martin, and I’m pretty sure the Martin brothers also have at least one sister waiting in the wings. This is more than enough for now, so let’s save them for the next post. See you on down the road, friends. FHL Film 158,674, Oglethorpe County, Georgia Deed Books C and D, 1798 – 1806, deed of 15 Aug 1799, George Martin to Claybourn Martin, both of Oglethorpe, $225 for 147 acres adjacent William Martin, Mrs. Waters, John Tanner, part of 538.5-acre tract granted Jesse Sanders, then located in Washington Co. Signed George (x) Martin. Thomas Wooten and Gibson Martin, witnesses. Deed Book C: 434. FHL Film 158,673, Oglethorpe County, Georgia Deed Books A and B, 1794 – 1798, deed of 19 Aug 1797, John Tindall of Columbia Co., GA to George Martin of Washington Co., GA, 538.5 acres on the Big Creek of Oconee Waters, part of Jesse Sanders survey granted 27 Aug 1786. Signed George (x) Martin. Witnesses John Barnett, Jacob Hinton. Deed Book B: 209. FHL Film 158,674, Oglethorpe Deed Book C: 420, deed of 20 Nov 1797 from George Martin to David Martin, both of Oglethorpe, $200 for 125 acres on the west side of Big Creek adjacent Miles Hill. Signed George (x) Martin. Witnesses Thomas Wooten, James Thomas, JP. Id., Oglethorpe Deed Book D: 73, deed of 11 Jan 1800 from George Martin to Henry Pope, both of Oglethorpe, $400 for 187 acres on both forks, waters of Big Cr., adjacent William Patrick, Claybourn Martin and Samuel Waters, part of the Sanders tract; Deed Book D: 74, deed of 28 Jan 1800 from George Martin to Henry Pope for $200 for 104 acres adjacent John Tanner, David Martin, Tindal. Signed George (x) Martin. Witnesses David (x) Martin, Thomas Wooten. Id., Deed Book D: 5, deed of 29 Jan 1800 from George Martin to Gibson Martin, both of Oglethorpe, $500 for 175 acres including the plantation where George lives adjacent Hinton, Pope, Tanner and Tindal. George Martin and wife Elizabethto retain possession during their lives. Witnesses Thomas Wooten Jr., Jacob Hinton. FHL Film 177,699, Oglethorpe County, Georgia Superior Court Tax Digests, 1806 – 1811. E.g.,FHL Film 158,674, Oglethorpe Deed Book C: 434. MariLee Beatty Hageness, 1799 Tax List of Oglethorpe County, Georgia(1995). FHL Film 177,699, Oglethorpe County, GA Superior Court Tax Digests, 1806 – 1811. Clayton Library microfilm No. R-1047, Oglethorpe County Georgia Land Lottery Eligibles 1807. There was no administration of George’s estate in Oglethorpe, undoubtedly because he had no significant assets left to administer. He evidently sold all of his land between 1797 and 1800, and he owned no slaves in the 1800 census. In those circumstances, there is virtually no chance that anyone applied to the court for an estate administration, nor would a court order sua sponte that one take place. FHL Film 158,674, deed of 20 Feb 1801 from David Martin to Henry Pope for $400, 125 acres on the east fork of Big Cr. including the plantation where Martin now lives, adjacent Henry Pope, Miles Hill. Signed David (x) Martin. Witnesses Charles Bedingfield, Thomas Wooten. Oglethorpe Deed Book D: 75. Michal Martin Farmer, Elbert County, Georgia Deed Books A – J 1791 – 1806(Dallas: 1997), abstract of Deed Book E: 47. Michal Martin Farmer, Wilkes County, Georgia Deed Books A – VV 1784 – 1806 (Dallas: Farmer Genealogy Co., 1996), abstract of Deed Book A: 39. Farmer, abstract of Elbert Co., GA Deed Book A: 128. Farmer, abstract of Wilkes Co., GA Deed Book PP: 1. The Third and Fourth or 1820 and 1821 Land Lotteries of Georgia (Easley, SC: Southern Historical Press and Georgia Genealogical Reprints, 1973). A child whose father died was referred to as an orphan, notwithstanding that the child’s mother was still living. Delwyn Associates, Records of Baldwin County, Georgia (Albany, GA: 1975), abstract of Will Book A: 22. Fred R. Hartz and Emilie K. Hartz, Genealogical Abstracts from theGeorgia Journal(Milledgeville) Newspaper, 1809 – 1840, Volume One, 1809 – 1818 (Vidalia, GA: 1990). Farmer, abstract of Elbert Co., GA Deed Book E: 47. Mary Bondurant Warren, 1800 Census of Oglethorpe County, Georgia (Athens, GA: 1965), listing for David Martin includes, among others, one male < 10. 1820 census for Baldwin Co., GA, p. 39, listing for Aly Martin, 010100-01201, no slaves. Birth years for the children are estimated based on listings for the family in 1800, 1810 and 1820. The 1820 census shows 1 male 16 < 26, probably born 1795 -1800 (since he appeared in the 1800 census), 2 females 16 < 26, but born 1800 -1804 (since they did notappear in 1800), 1 male 10 < 16, born 1804 -1810, and 1 female 10 < 16, born 1804 -1810. Frank Parker Hudson, Wilkes County, Georgia Tax Records, 1785 – 1805, Volume One and Volume Two (Atlanta: 1996). Farmer, abstract of Elbert Co., GA Deed Book E: 105. Fred W. McRee, Jr., Oglethorpe County, Georgia Abstract of Wills 1794 – 1903 (2002), abstract of Will Book B: 10; FHL Film 158,674, Oglethorpe County, Georgia Deed Books C and D, 1798 – 1806, Deed Book C: 434. Note that Claiborne and Frances Martin named their first child Elizabeth. Typical English naming patterns suggest that one of the child’s grandmothers had that name. Frances’s mother was named Amy, not Elizabeth. Thus, Claiborne and Frances’s child named Elizabeth is some evidence, although slender, that Claiborne’s mother shared that name. Author Robin WillisPosted on October 28, 2018 November 10, 2018 Categories Martin ArticlesTags Alay Martin, Alcy Martin, Alice Martin, Aly Martin, Claiborne Martin, Clay Martin, David Martin, Elizabeth Martin, Frances Buckley Martin, Gibson Martin, Henry Pope, Hugh Martin, John Martin, William MartinLeave a comment on Martin & Buckley, Part 2: Who Were Claiborne Martin’s Parents & Siblings? My ancestor Claiborne (“Clay”) Martin has been a longstanding brick wall. He was born in North Carolina in the latter part of the 18th century. Unfortunately, Martin is a relatively common name in that time and place: the 1790 federal census has 177 Martin heads of household listed in North Carolina. The numbers are daunting. who were Clay’s siblings and parents? who were the siblings and parents of Clay’s wife Frances? God willing and the creek don’t rise, I will manage to complete a series of articles addressing these questions before I get diverted onto yet another Rankin rabbit trail. Let’s start with a brief summary of Clay’s life. He was born in North Carolina about 1767, but had moved to Georgia by at least 1785. Given his relatively young age at the time, it seems likely he moved with family. He was a farmer and a slave owner. He married his wife Frances circa 1794, probably in Elbert County, Georgia. Clay and Frances raised a large family – two sons and nine daughters survived to adulthood – in Oglethorpe County, Georgia, before moving to Perry County, Alabama. I like Clay, despite his slave ownership, because (among other things) he took care of his extended family. When one of his brothers died in Oglethorpe, Clay paid property taxes on behalf of his brother’s widow for several years. He also paid taxes for a year on behalf of a widowed sister. He stayed out of politics, public life, jail, lawsuits and other controversies. So did his children. He and Frances were married for roughly sixty years, which is no mean feat (said the woman who has been married more than 50 years). Here is a charming thing about Claiborne and Frances Martin: they had mules named Bill and Cuff and horses named Jimmie and Ned. What are the odds that, 170 years from now, someone will unearth the name of your animals? Only, I’m guessing, if they are preserved in answers to the security questions on your bank account. Clay is identified in an abstract of Georgia records as a Revolutionary War veteran. That is probably wrong. At first glance, it seems unlikely that Clay served, because he was only fourteen (maybe sixteen, given the margin of error in census age reporting) when the war was mostly over. However, my husband Gary tells me that there were actually soldiers that young. The evidence is at odds with the abstract, even ignoring the age issue. First, Clay never applied for a Revolutionary War pension, although he would have been eligible under the act of 1828 if he had served for at least nine months – or six months, under the 1832 act. Clay was still alive in 1832, and would presumably have applied had he been eligible. Second, the abstract also names Gibson Martin, Clay’s brother, as a Revolutionary War soldier. Gibson’s grandchildren kindly erected a tombstone for him in Oglethorpe County giving his birth date as September 10, 1770. Cornwallis surrendered at Yorktown in September 1781, when Gibson was just turning eleven, much too young to have served. If the abstractor erred with respect to Gibson’s war service, he/she was probably also wrong about Clay, since both names purportedly came from the same list found in the office of the Oglethorpe Court of Ordinary. Eventually, I will get a look at that record. I suspect it will be evidence that Clay and Gibson were entitled to draw lots in the Georgia land lottery because their father was a Revolutionary War soldier. In September 1818, Clay sold his land in Oglethorpe. Some time during the next twelve months, Clay and Frances and a large extended family moved to Alabama. One of Clay’s daughters – my ancestress Amy Martin – married my ancestor Isaac Oakes (also born and raised in Oglethorpe) in Dallas County, Alabama in October 1819. Clay was not listed as a head of household in the 1820 census for Dallas County, and there is no extant 1820 census for Perry County, so the census is no help. It’s a good bet, however, that Amy, age nineteen at the time, didn’t move from Georgia to Alabama without family chaperones. In fact, Claiborne’s father-in-law was definitely in Perry County by 1819. Once in Perry County, Clay farmed and cared for family. He gave his eldest son a gift of land, provided for his children and grandchildren in his will, and took care of his widowed daughter Sarah and other family members. The Martins apparently never got to enjoy an empty nest. In 1850, when Clay was 83 and Frances was 74, they had seventeen-year-old and fourteen-year-old girls living with them (children of their widowed daughter, Sarah Martin Crow). In the 1840 census, there were six children under the age of fifteen and several young adults in Frances and Clay’s household. So far as I can determine, their own youngest child was born in the middle 1820s at the latest, and was married before the 1840 census. Consequently, the six kids living with the Martins in 1840 likely qualified as extended family, probably grandchildren. I’m exhausted just thinking about it. Clay died in Perry County about September 1853, leaving a decent estate that generated a huge probate file. Those documents conclusively prove his wife Frances, the identities of children and some of their spouses, and quite a few grandchildren. The moral: in genealogy, as with everything else in this life, it pays to come from a family that is moderately well-to-do. Here are Claiborne and Frances Martin’s children and their spouses, all proved in Clay’s will and/or in Perry County estate files. Elizabeth Martin,vb. abt 1794 Oglethorpe, d. by 1851, Perry, m. Theodoric Oliver 1820, Dallas AL. Two children. Fanny Martin, b. abt. 1798 Oglethorpe, d. 1860-70, Union Par. LA, m. John Smith 1814 Oglethorpe. Six sons. Amy Martin, b. 1800 Oglethorpe, d. 1865 Claiborne Par. LA, m. Isaac Oakes (b. 1797 Oglethorpe d. 1885 Claiborne) 1819, Dallas Co. AL. Ten children: Elizabeth, Elijah Moseley, Haney, Washington Lafayette, Reuben M., Susan, Isaac C., Lucy Frances, Nancy Wisdom, and John L. Oakes. Frances Martin, b. bet. 1800-1810 Oglethorpe, d. bef. 1865, m. David Chandler 1827 Perry Co. 6 children. William Buckley Martin, b. abt. 1806 Oglethorpe, m. Susan A. MNU. Probably 10 children. Sarah A. martin, b. abt. 1807 Oglethorpe m. Silas Harlan Crow 1827, Perry AL. Children Mary Frances, Silas H. and Isaac M. Crow. Clara Martin, b. abt 1812 Oglethorpe d. aft 1880 m. John J. Hunter 1830 Perry AL. 8 children. Lucinda “Lucy” Martin, b. abt 1812 Oglethorpe d. bet. 1860-70 Perry, m. Jesse Suttle 1831 Perry AL. Eleven Children. Claiborne Jackson Martin, b. 1815 Oglethorpe d. 1892 Freestone Co., TX, m. Elizabeth b. Kelly (1818-1903) 1837 Perry AL. Five children. Malinda Martin, b. abt 1823 Perry d. 1853-56 Perry, m. Zachariah Chandler 1839 Perry AL. Seven children. Frances Martin died in Perry County in 1865, about age ninety. By my count, the Martins had 69 grandchildren. I may have missed some. She and Clay were undoubtedly both buried in Perry Co., probably on their own farm. Their tombstones, if there were any, have long since either been reclaimed by the land or swiped by someone who collects that sort of thing. That will have to remain a mystery. There is NO WAY I am wandering around any more woodsy cemeteries in Perry County looking for ancestors’ tombstones. Gary and I did that during a genealogy trip in August 2007, and we learned a very, very hard lesson about Alabama chiggers. That is pretty much everything I know about Clay’s life, other than some facts relevant to identifying his family. I will save those for subsequent posts in this series. See you on down the road. It’s kind of nice to let the Rankins be for a while. 1850 federal census, Perry Co., AL, Radfordsville, dwl 61, listing for Claiborne Martin, 83, b. NC, farmer, Frances Martin, 74, b. VA, Sarah Crow, 43, b. GA (neé Martin), and Sarah’s two daughters. Clay first appeared in the records in a Wilkes Co., GA deed of 28 Dec 1792, when he was about twenty-five (see note 1). Michal Martin Farmer, Wilkes County, Georgia Deed Books A – VV 1784 – 1806(Dallas: Farmer Genealogy Co., 1996), abstract of Deed Book PP: 1, deed from David Martin and wife Alcy of Elbert Co., GA to Archer Skinner of Wilkes Co., witnessed by Clabourn Martin. David Martin had been appearing in the Wilkes County records since 1785. Assuming that David was Clay’s brother, which is highly likely (more on that later), it is reasonable to assume that Clay had alsobeen around Georgia since at least 1785. E.g.,1840 federal census, Perry Co., AL, p. 250, Claiborne Martin enumerated with five slaves; 1850 federal census, slave schedule, Perry Co., AL, Radfordville, Claiborne Martin listed with twelve slaves. The Martins’ marriage date of 1794 is a rough estimate based on Frances’s birth date (1775 or 1776 according to the 1860 or 1850 census) and the births of their children, three of whom were born during the 1790s. Seenote 1 (1850 federal census); 1860 federal census, Perry Co., AL, p. 633, dwl 22, listing for Frances Martin, 85, b. VA; Mary Bondurant Warren,1800 Census of Oglethorpe County, Georgia(Athens, GA: 1965), Claiborne Martin enumerated with three females under age ten in his household. Clay and Frances were likely married in Elbert Co., because that is where both lived when they married. FHL Film 1,509,297, Perry County, Alabama Probate Records – Lockett, Napoleon to Martin, George M., File #53-022-1069, estate records of Claiborne Martin (hereafter “Martin Estate Records”). The file, which I copied in its entirety and have transcribed, contains numerous documents identifying Clay’s children and heirs. Documents include Clay’s will, depositions, and several accounts of the estate distribution. Clay and Frances left Oglethorpe for Perry Co. about 1818. FHL Film 177,699, Oglethorpe County, Georgia Tax Digests, 1806 – 1815. Claiborne paid county land taxes on behalf of Gibson Martin, deceased, or his widow Sarah/Sally Martin, during 1810 through 1816. Id.Claiborne paid land tax on behalf of Elisha Herrin (whose wife Sally was neé Martin) in 1811. Clay and Frances were probably married circa 1794, see note 4. Clay’s will was recorded on 12 Sep 1853, and he probably died shortly before that date. Martin Estate Records. Martin Estate Records, appraisal dated 8 Sep 1865 of the personal property of the estate of Claibourn [sic] Martin, taken after Frances died. Per her husband’s will, Frances owned only a life estate in their property. That ownership interest terminated when she died. As a result, the estate remaining after her death was administered as part of Claiborne’s estate, even though Frances died about twelve years after Claiborne. The remaining estate was therefore disposed of in accordance with the terms of Claiborne’s will. Marie De Lamar & Elisabeth Rothstein, The Reconstructed 1790 Census of Georgia(Baltimore: Genealogical Publishing Co., 1989). The 1828 act did not require the applicant to prove he was indigent, as had the previous pension legislation. W. T. R. Saffell, Records of the Revolutionary War(Baltimore: Clearfield Company, Inc., originally published 1894; reprinted by Genealogical Publishing Co., Inc., Baltimore, 1969). Historic Oglethorpe Co., Inc., Cemeteries of Oglethorpe County, Georgia(Fernandina Beach, FL: Wolfe Publishing Co., 1995). FHL Film 158,677, Oglethorpe Co., GA Deed Books J and K, 1818 – 1823, deed of 18 Sep 1818 from Claborn [sic] Martin of Oglethorpe to John McCleath, 170 acres on the waters of Big Creek, Deed Book J: 154. Clay’s last appearance on the Oglethorpe County tax list was also in 1818. FHL Film 177,700, Oglethorpe County, GA Superior Court Tax Digests, 1816 – 1824. Family Adventures, Early Alabama Marriages 1813 – 1850(San Antonio: 1991), 18 Oct 1819 bond, Isaac Okes [sic, Oakes] and Anna [sic, Amy] Martin, Dallas Co., AL. The first Alabama record I found for Clay was a May 1822 order in the court minute book appointing him to a jury to lay out a road. Original of Perry County Record Book 1826 – 1840 at p. 29, viewed at the Perry County courthouse in August 2007. Note that the title of the book suggests that it dates from1826. However, actual entries begin in 1820. Perry County was created 13 Dec 1819. FHL Film 1,578,227, item 1, Perry County, Alabama Deed Book B (cont’d), deed from Claiborne Martin to his son, Buckley Martin, for love and affection, 158.52 acres. Deed Book B: 56. See also Martin Estate Records and notes 6 and 7. 1850 federal census, Perry Co., AL. 1840 federal census, Perry Co., AL. Family Adventures, Early Alabama Marriages 1813 – 1850(San Antonio: 1991), marriage bond of Zachariah M. Chandler and Malinda Martin, 7 Mar 1839. See id. Claiborne and Frances’s eleven children were Elizabeth (wife of Theodorick Oliver), Haney (second wife of Thomas Oakes), Fanny (wife of John Smith), my ancestor Amy (wife of Isaac Oakes), Frances (wife of David Chandler), William Buckley Martin (wife Susan LKU), Sarah (wife of Silas H. Crow), Clara (wife of John J. Hunter), Lucinda (wife of Jesse Suttle), Claiborne Jackson Martin (m. Elizabeth Kelly), and Malinda (wife of Zachariah M. Chandler). Isaac and Amy Martin Oakes had a daughter named Haney, my ancestress, who is easy to confuse with her aunt Haney Martin Oakes, wife of Thomas. Right now, someone out there in the blogosphere is rolling his/her eyes and thinking there cannot possibly be any connection between a melon and family history research. Just keep reading, Mr./Ms. Skeptic. Hahahaha … OK, friend, we’ll address that shortly. Meanwhile, we have two genealogy questions. First, what do you want from a family history blog? Are you more inclined to look for general articles, such as the ones we have published about genealogical proof, the Scots-Irish, legal issues relevant to genealogy, or how to identify a second cousin once removed? Perhaps you’d like to see reviews of family history books? Or are you more interested in specific ancestral lines? This blog has been oriented thus far toward particular families with a few general articles sprinkled in. Here’s the second question: what family line(s) particularly interest you? Check out the list of our ancestral names on the “ABOUT THIS WEBPAGE” link and let us know if any of them pique your interest or if you have another family you’d like to see as the subject of an article. Many of you know how to contact us directly via email. If not, there is a link on the website for posting comments. I saw a woman a few years ago at Houston’s Central Market shaking a cantaloupe while holding it up to her head — first to her right ear, then to her left. Fascinated, I asked her what the hell she was doing. She claimed that she can hear the seeds rattling if a cantaloupe is ripe. Ummm-hmmmm. I have made a total fool of myself trying that several times while never hearing a blessed thing. Another theory is to look at the white sort of lattice pattern on the rind. The more closely-spaced the lattice pattern, the more ripe it is. Surely this is arrant nonsense. Also: press with your thumb on the end where the cantaloupe was attached to the vine. A ripe cantaloupe theoretically yields a bit to gentle pressure. This at least has some superficial logical appeal. However, they all seem totally unyielding to me. Never mind the theory: I consistently buy rock-hard cantaloupes. Gary, on the other hand, picks nothing but winners. He has the same talent with avocados. Go figure. The only reasonable conclusion, IMO, is that men should do all the grocery shopping. Fortunately, genealogy is far more consistently rewarding, if less nutritional, than cantaloupes. As for genealogists in general, an Alexander cousin likes to say: NOBODY HAS MORE FUN THAN WE DO! So keep on truckin,’ and I’ll see you on down the road. Senator Alexander needs someone to examine his Rankin roots! It is unlikely that he is related to both Rev. William B. Rankin (call him “Rev. William,” since he had a Doctorate of Divinity) and Professor Thomas Samuel Rankin (“Prof. Thomas,” who taught Latin, bless his heart, for 47 years). Here is a link to information about Rev. William published online by Tusculum College. 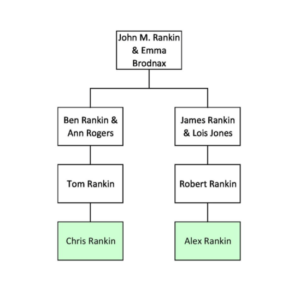 Here are outline descendant charts for both of the Rankin men Sen. Alexander claims as relatives. Part of Rev. William Bradshaw Rankin’s chart is taken from his own S.A.R. application. His ancestry was easy to verify, because this is an extremely well-documented Rankin line. The application says that Rev. William remembered his grandfather talking about the surrender of Cornwallis at Yorktown. And Rev. William said he owned a piece of grapeshot from Yorktown that his grandfather gave to him. I was charmed. I’m tickled to claim him as a distant cousin. 1 John Rankin, birth date unproved, died 1749 in Lancaster Co., PA. Wife traditionally identified as Mary McElwee; will names his wife as Margaret. 2 Thomas Rankin, abt. 1724 – 1812. Wife Isabella Clendenon (various spellings). 3 William Rankin, 27 Jan 1759 – 13 Dec 1833. Wife Sarah Moore, 21 Jul 1764 – 9 Oct 1850. William was the Revolutionary War soldier whose service was the basis for Rev. William’s S.A.R. application. See Virgil White’s abstract of William’s pension application in the footnote at the end of this sentence. William and Sarah are both buried in the Timber Ridge Cemetery in Greene Co., TN. 4 Anthony Rankin, 1794 – 1872. He married Margaret Gray (1796 – 1863) on 25 Dec 1821 in Washington Co., TN. Both are also buried in the Timber Ridge Cemetery. 25 Dec 1821. 5 Rev. William Bradshaw Rankin, MA, DD, 1825 – 1903. He is buried in the Salem Churchyard at Washington College, Limestone, TN. 1 David Rankin Sr., birth date unproved, d. 1802, Greene Co., TN. Wife’s identity unproved. 2 Robert Rankin, wife Elizabeth Dinwiddie of Greene Co., TN. Possibly married in Campbell Co., VA in 1798. Robert’s Greene Co. will named his son Thomas C. Rankin as an executor. 3 Thomas C. Rankin(30 Mar 1806 – 12 Nov 1851) and Elvira Blackburn (1810-1901). His 1851 will named his son Robert. Thomas and Elvira are both buried in the Mt. Bethel Presbyterian Cemetery in Greene Co.
4 Robert Rankin, b. 25 Mar 1832 – d. 15 Apr 1866, Greene Co., TN. Wife Margaret McGaughey. Married in Greene Co. in 1854. 5 Professor Thomas Samuel Rankin, b. 15 Jun 1858 d. 30 Oct 1938 or 1939, buried Oak Grove Cemetery, Greenville, Greene Co., TN. Tombstone says he was “47 years professor of Latin” and a college trustee, as well as a ruling elder of Mt. Bethel Presbyterian. His first wife was Margaret Folk (1849 – 1887); second wife was Mary Coile (1866 – 1941). As always, please let me know if you spot any errors or have any questions. Senator Alexander, I welcome your comments! William Rankin, wife Sarah, served in the PA and VA line. Born 27 Jan 1759 “some 5 miles below Carlisle in Cumberland Co., PA.” He lived at Juniata in that county at enlistment. In Jun 1780 he moved with his father to Augusta County, VA and also enlisted there. Soldier married Sarah Moore29 Aug 1787 in Greene Co., TNand she was b. Jul 1763. Soldier d. 13 Dec 1833, widow applied 25 Mar 1844 in Green Co., TN. Children were (1) Thomas b. 13 Jul 1788, (2) Peggy b. 1 Jan 1790, (3) John Moore Rankin b. 10 Apr 1792, (4) Anthony b. 23 Aug 1794 (see Greene Co. TN records for Anthony) (5), Isabel Clindinon Rankin b. 30 Aug 1796, (6) William b. 23 Mar 1799, (7) Ginny b. 17 Nov 1801 and (8) David b. 10 Feb 1804. The Encyclopedia of Quaker Genealogy, 1750-1930, Vol. VI(MyFamily.com, Inc., 2006), 849. So … Is He My Second Cousin or My First Cousin Once Removed??? I’ve been talking to a friend who is a fifth cousin once removed. “How on earth,” she said, “do you determine our relationship?” I mumbled something incoherent about “rules” concerning degrees of consanguinity before concluding it was impossible to explain without visual aids. Most of you undoubtedly figured out long ago how to tell a fourth cousin from a fifth cousin, and what “once removed” and “twice removed” mean. It took me a while to get to an “AHA!” moment on those issues. If this stuff is old hat for you, please head for this website’s archives and find an article about genealogical proof, or legal concepts in family history research, or the Scots-Irish. If you have had any trouble calculating consanguinity, please read on. There WILL be visual aids. OK, we all know how to identify a first cousin, right? He, or she, is a child of one of your parent’s siblings, and you share a set of grandparents. 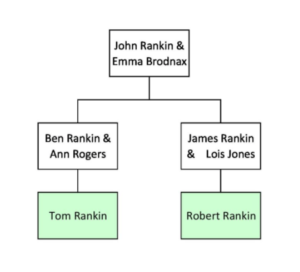 The chart below shows a pair of Rankin first cousins, Tom and Robert (the green rectangles), grandsons of John Rankin and Emma Brodnax. Please note: John and Emma, my grandparents, are the only real people on the charts in this article. All others are fictional. Please notice that there is one generation in between the first cousins, Tom and Robert, and their common ancestors, John and Emma. OK, moving on, let’s add a generation: Chris and Alex, sons of Tom and Robert, respectively – the green rectangles in the chart below. Chris and Alex are second cousins. Note that there are two generations between the second cousins and their common ancestors, John and Emma. “Removed” simply means that one of the cousins has more generations between himself and the common ancestor than does the other. In the chart below, Tom and Alex are first cousins once removed, since Alex is one more generation “removed” from their common ancestors John and Emma. Simple, oui? Hahahaha … I still have to sketch a little chart in order to figure out distant relationships. Alternatively, I could just enter the family into my family tree software and let it calculate the relationships. But what fun would that be? Author Robin WillisPosted on October 10, 2018 October 10, 2018 Categories Articles, MiscellaneousTags degree of consanguinity, first cousin once removed, second cousin2 Comments on So … Is He My Second Cousin or My First Cousin Once Removed?? ?